When Audioquest released the original Dragonfly DAC it was to huge fanfare and praise after offering far improved audio than most standard laptops and computers come with when pre built. Since then there has been a huge increase in the number of competitors offering USB DAC's (Digital Analogue Convertor). Such as the way it goes amongst the audiophile community the Dragonfly 1.0 was beginning to look a bit dated due to this new gear hitting the market andwith that in mind Audioquest has taken to refining the already excellent Dragonfly v1 and tweaking it just enough that its still a top of the line in the small usb DAC category. *Long Term Update - I have been using the Audioquest Dragonfly V1.2 for over a year now and continue to be impressed every time I go out with it. I have been using the Audioquest Dragonfly V1.2 with android for the most part but also out of USB port of my Macbook Pro Retina. It works flawlessly for me on my current phone (the Motorola Nexus 6) and saves me carrying my awesome but far bulkier Aurender Flow around. I have updated the rest of this article accordingly to reflect my long term feelings on this portable USB DAC /Amp solution. Packaging of the Dragonfly is excellent, cool design and graphics in a nicely textured cardboard box and sleeve combo rally make it stand out. The is some good information also for those that might be buying off shelf. Inside the DAC and pouch are both very well protected and presented. They are encased in a semi rigid foam and fitted very snuggly, absolutely no worries on this thing coming loose during transport. Not to many accessories are included but that is more down to the simple function of the product there is no real requirement for additional parts so it is not really an issue. Bonus points are awarded for the inclusion of a small dragonfly branded leather pouch which should keep your device in tip top shape when thrown in a bag or a pocket. The Dragonfly is a very simple design. Disconnected from the computer it would easily be mistaken for just an ordinary USB stick with a dragonfly logo on it. Plug it in however and the thing glows and flashes all different colours. It looks awesome, especially when we had it hooked up with our Alienware laptop and its multicoloured keyboard. Finish is nothing short of excellent, as soon as you pick it up the high level build quality shines through and it feels sturdy and robust to hold. Finally we should mention that this, for a DAC of such impressive sound quality, is positively miniscule. A well thought out design indeed. The main component that gives the Dragonfly its sound is the SABRE dac which lurks inside its rather modest shell. Make no mistake the Sabre is a beast and a fan favourite amongst audio enthusiasts. Its incredibly easy to us, you simply plug it into one of your Mac/PC's free USB ports and away you go. Volume attenuation is controlled completely through your computers usual volume control so there is no messing around with bundled proprietary software. Once we were up and running, we were rewarded with some excellent sound. The Dragonfly is undeniably clear and clean but manages to retain a sense of intimacy when other products come across somewhat cold or dark. When you put it up against the headphone out of our macbook air, pro and our Thinkpad x240 it was night and day. The dragonfly doesn't just make the sound better, it does so exponentially. Detail levels are extremely high and most likely more than you would ever need when using headphones on the go. We had it hooked up with our Minerva Mi-Artist Pro for over 2 weeks and it was a thoroughly enjoyable presentation. A lot to do with the sound you get out of the Dragonfly will have to be to do with the headphones or earphones you choose to use it with but users can expect the following. With that all in mind it would be hard to recommend other dac's at any price above. We just can't see much of an improvement in sound quality that would be detectable to most users ears. What the dragonfly does it does with aplomb and as long as you are ok with being limited to a bit-rate of 96/24 then this is one of the best DACs on the market. 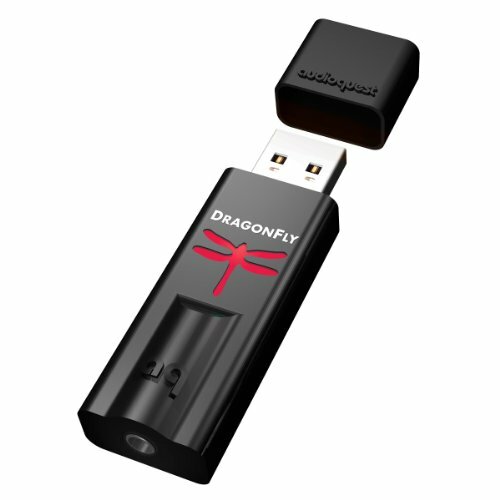 As an additional point we would like to also add that many users have found great success in combining the dragonfly with android mobile devices, this manages to bypass the oft poor sound quality of most mobile devices. With a low price, great build and finish and excellent sound Audioquest still have a winner on their hands with the dragonfly. Its a combination of them doing so many thing right that makes us love this little guy. Whilst some users may find the lack of bit-rate support limiting and may also with to look at units with a built in amp section, users that want an easy to use and extremely portable device may just have found their perfect match. How to choose a headphone amplifier?